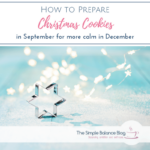 Looking at the demands that Christmas season is placing on us, it’s really no surprise at all that many consider this to be the most stressful time of the year. So wouldn’t it be nice if someone gave you a break just for 15 minutes? Something that semi-forced you to slow down, breathe, relax and enjoy the season? If you’d love that, chances are so would the people around you. 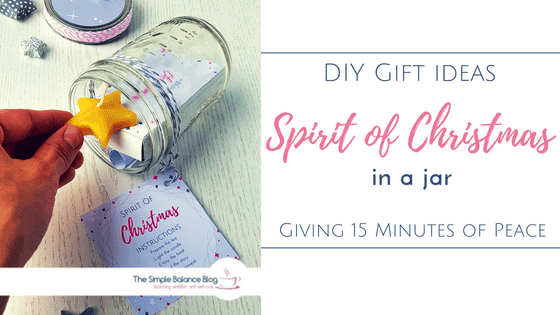 And that is why I created DIY gift ideas for Spirit of Christmas in a jar. The idea is to give someone a complete kit with everything they need to enjoy the Spirit of Christmas even just for a few minutes. What gets most people to calm down while highlighting the Christmas season? A hot drink and a candle, a treat and a short story to read. 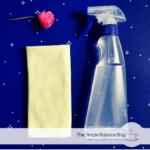 These simple components contain everything needed for a moment of self-care during a busy season. That is why this DIY gift idea emanates an incredible sense of tranquillity. Its simplicity makes it a great little gift for neighbors, teachers, the helpful staff at the doctor’s office, and dear friends. This DIY gift is fairly inexpensive, quickly put together and comes with neverending options to personalize it. However, what I like best about this thoughtful gift in a jar is how it shows appreciation with little risk that the other person will feel obliged to gift back. I created printables so you can decorate all your components to match, which you can get for free in my VIP area. However, it is entirely up to you how much time and effort you want to invest. You can keep it really simple with store-bought treats and packaged drinks. Or you can go all out and sew a star-shaped tea bag. Well, let’s not get carried away… First, let me give you the main components as well as ways to customize your DIY gift in a jar. My favorite go-to is a tea bag because it’s small, inexpensive, looks fairly pretty and, well, I like tea. But not everyone is into tea, so there are several other options. Instant espresso sticks or ready-made coffee mixes are great for coffee lovers. Chocolate aficionados would probably enjoy a store-bought or homemade hot chocolate mix. Really, any hot drink that can be whipped up in a few minutes will work well. I like the simplicity of a tea candle decorated with washi tape. But maybe you know someone who loves beeswax candles? Then swap some beautifully shaped candles for the tea light. If you’re giving this gift to someone working in an office or other public space where a real candle wouldn’t be allowed, consider using a small LED candle instead. 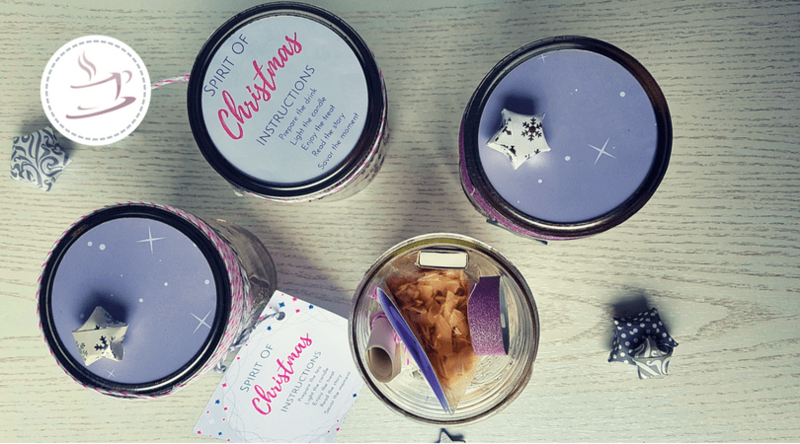 Matches are optional, but when decorated with washi tape, they sure add to the look of this gift in a jar. Scented candles would make this Spirit of Christmas in a jar experience even more sensual – provided the recipient enjoys those. 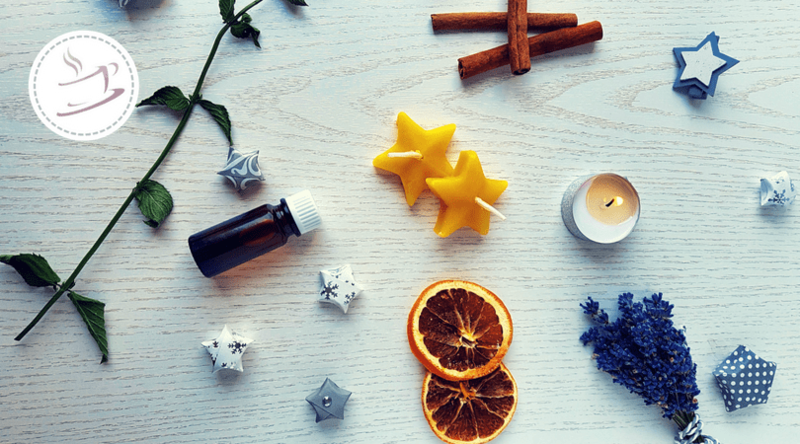 If you’d like to add some scent without the somewhat artificial smell of scented candles, I have more options for you: Add a few drops of wild orange essential oil to a dried slice of orange – or cinnamon and clove essential oils to a stick of decorating cinnamon. Or you could use a small cone and add a few drops of pine essential oil. The most obvious choice would, of course, be a homemade Christmas cookie. But in the interest of lower stress levels, store-bought cookies will work just as fine. A small gingerbread cookie, decorated cutout cookies or even homemade slice & bake cookies are a great way to treat someone. For the health-conscious people in your life, a treat wouldn’t have to be a cookie. A small bag of coconut chips makes a great alternative to conventional treats. Christmas is an inherently Christian holiday so naturally, adding the biblical Christmas story might be considered a no-brainer by some. However, a less religious story might add more to the relaxing and pensive mood you are trying to set with this gift. Here are links to a few Christmas-themed stories which you could choose from – or pick your favorite story or poem and print it. 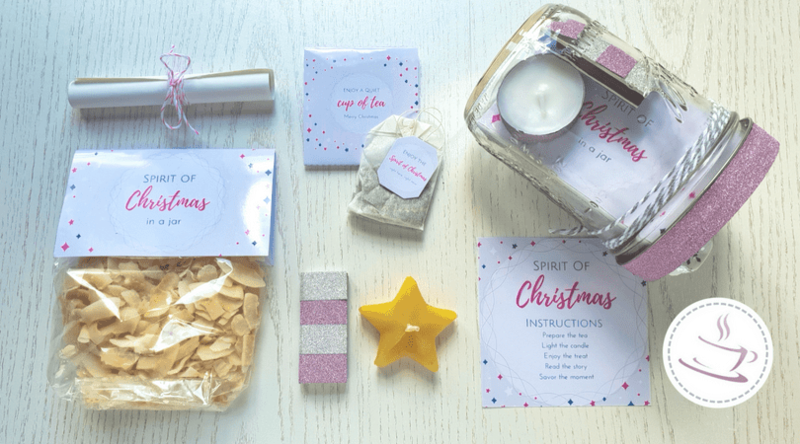 My templates contain labels for matchboxes, the instructions on how to use the Spirit of Christmas in a jar, labels for a treat, as well as a wrapper for a regular sized tea bag. It also comes with a page of pattern you can print to decorate the top of your mason jar lid. Or cut it up whichever way it helps you to cover unsightly packaging. I’m not much into green and red colors which is why I strayed from the traditional Christmas colors. However, if you prefer a variation of the green-red theme that Christmas has going on, pick the green printable. If you want to make more than one of these, I suggest you work in batches, doing each step for all jars before moving on to the next. 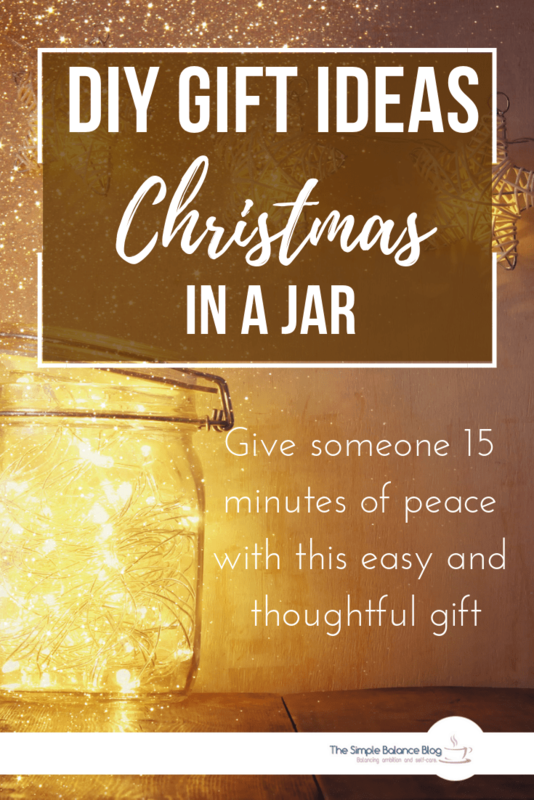 Consider making an extra Spirit of Christmas in a jar for yourself to enjoy when you need it the most. You can print on regular paper or, for a more professional look, on white or cream-colored cardboard. Surprisingly, photo paper works, too, but might get a bit expensive if you’re making a bunch of DIY gifts in a jar. To create a cover for the mason jar lid, use the lid to trace a matching circle on the pattern paper. If you prefer to add the instructions to the lid rather than attaching it with ribbon, trace a circle around the instructions. Using washi tape, decorate your candle and small matchbox. 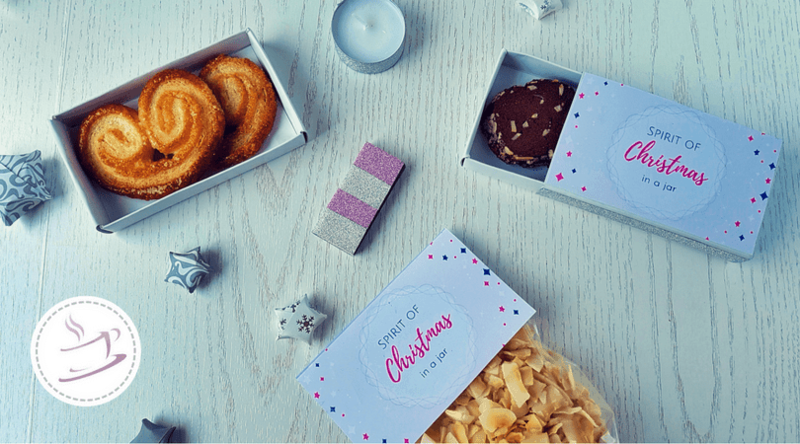 Place your chosen treat in a large matchbox (order them here) or a clear cookie bag. If you choose the bag, use the closure flap template and fold it in half. Now it can be stapled over the opening of the bag or attached with adhesive tape. Decorate the large matchbox using the two covers on my printable. You might want to add matching washi tape to the small sides but that’s totally optional. If you’re going for the tea bag wrapper, fold it at the dotted line and keep in place with adhesive tape. Place the tea bag inside and close, using a small sticker or piece of washi tape. If this is too fiddly for you, use the template for small matchboxes to cover the tea bag label from both sides. Use the same small matchbox covers to decorate a stick of instant espresso or coffee. A homemade hot chocolate mix can be added to a small ziplock or gift bag and decorated with the cookie bag cover or any of the labels that you like. Cut or fold your printed story to fit the size of your jar and roll it up. Secure with a ribbon, sticker, or washi tape. Glue on the patterned paper circle or instructions. If you’d like to cover the sides of the lid with string, cover the sides with double-sided sticky tape and then circle the string around neatly. Starting with the largest component, place each item in the mason jar. Finally, add any extra decoration and close the lid. Decorate with ribbon, washi tape and, if you didn’t put it on the lid, attach the instructions. If you’d like, add the gift tag that comes with the printout. If you want to send these gifts by mail, use a gift bag instead of the mason jar. You could even make your own by using the patterned page of the printout. Here’s a link to a video tutorial on how to make gift bags the easy way. If you have no suitable clear gift bags to use for your treat or drink, you could make your own using clear gift wrapping foil. Simply follow the tutorial for paper gift bags. I wasn’t kidding when I mentioned the hand-sewn tea bags. If this is your way of showing love, go ahead and follow this tutorial. If you wanted to, you could use a star-shaped template and use this instead. For an extra wow effect, you could bake matchstick cookies and place them in a large matchbox. 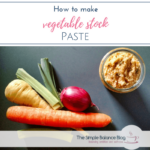 Here is a recipe if you are feeling up for it. I must warn you, though: I did this for 40 gifts one year and came to regret it. So only do this if baking is a way for you to wind down. I hope I was able to show you, that the DIY Spirit of Christmas in a jar can be as simple or as elaborate as you want. My simple balance tip is: When time is short, use purchased treats, gift bags and washi tape to keep things as simple as possible. Keep the more elaborate version for another year. Also, reduce the number of recipients and consider buying something small for a larger crowd. 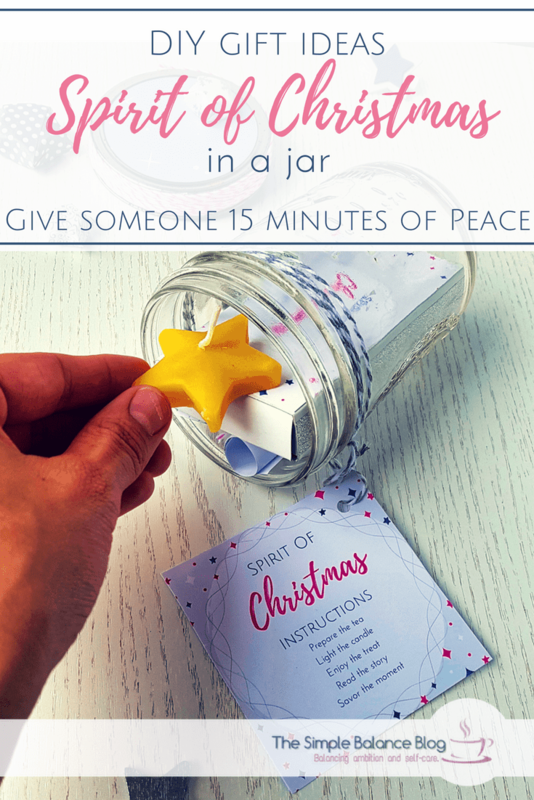 But no matter what level of effort you choose – these Spirit of Christmas in a jar DIY gifts will most definitely bring lots of joy to the people who receive it. very informative and awesome gift ideas for Christmas gift. this kind of gift will be liked by all.